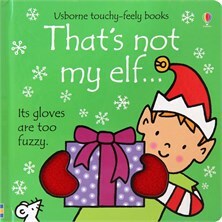 There are five mischievous elves to meet in this touchy-feely Christmas board book, with shiny boots, fluffy scarves and soft hats to keep them warm at the North Pole. The bright pictures and textured patches for babies and toddlers to stroke are designed to help develop sensory and language awareness. A delightful book to share with little ones. These wonderful books are awesome for helping children to develop. The stories are perfectly interactive and their simplicity means even the youngest readers will enjoy them and relate to them. The hardwearing pages, simple illustrations, repetition and lovely touchy-feely elements to each page make the [That's not my...] books ideal for reading with your child. Unlike other board books, there are swatches of different textures on each page designed to encourage your little one to explore and play independently.